Thanksgiving is just a few days away, and the turkeys are not the only ones stressing out a bit. 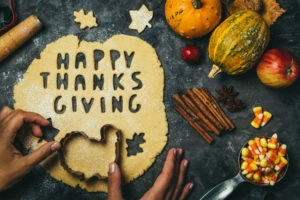 If you are the lucky one who is hosting this year’s feast, there are many things to do – on top of your day-to-day cooking, cleaning, laundry and general maintenance of your sanity — and of course, who can forget the children? You have enough on your plate – we’ll do the list-making for you so that when Turkey Day rolls around, you are ready to roll. We do the Thanksgiving Day checklist; you make it happen! List out each dish you will prepare and include anything that friends or family may bring. Make a list of ingredients needed per dish so you can tackle your shopping list. Toddlers may have tantrums, football teams may lose and husbands may fall asleep right after dinner, but what everyone will remember is the food! Seating and Settings: As we have mentioned, Thanksgiving is all about the food and the fellowship. To ensure both go well, you want a sure-fire seating chart and table settings to match. Many gatherings host a Kids Table and one for the adults. If you do the same, make the Kids Table a fun, friendly place, free of breakables or items that can be damaged. Instead, opt for holiday-themed paper plates and cups set out on disposable table cloths. Plastic silverware and your table is just about done. To add a personal flare, have your own children decorate some table decor like turkey handprint placemats or a pretty, leafy centerpiece. For the adult table, you can bring out the big guns with your crystal, china and other items you save for the holidays. However, remember that most of the table will be covered with food in a matter of minutes! Focus on an elegant yet simple place setting and if you’re hosting a large crowd, a small centerpiece. This is a great time to bring out the lovely serving dishes and utensils that may have been wedding or anniversary presents and rarely get to see the light of day! And on that note, remember that serving dishes and utensils as well as table settings can often be laid out and even set well in advance of Turkey Day, giving you a little less to do on Thursday! Holiday Fashion: This may sound like a small detail but there is nothing as stressful as not knowing what you – or the rest of your family – should wear minutes before your guests arrive. Amidst all the turkey defrosting and roasting and mashed-potato making, you might forget about clothing, so here’s your reminder! Lay out everyone’s outfits the night before. This will ensure what you want is clean, ironed and where you can locate it. Protect the pretty things. Don’t put your 5-year old – or yourself for that matter – in your Sunday best until right before people arrive. Kids are kids and you’ll be cooking so better to leave the wardrobe change until the last minute. Remember that this is not the Royal Family. You and your family do not need to be dressed in smocked outfits or matching monograms to enjoy the day. As a mom, you understand the horror and all the preparation that goes into a family photo shoot and no one says that Thanksgiving Day has to be yours. Feel free to keep it simple — everyone in denim and various tops, or pick some coordinating colors that run through everyone’s outfit. If you are expecting a houseful, wardrobes may be the very last thing on your list so feel free to keep it simple. And if this is going to be something keeping you up at night, don’t let it! Know what you will do on Thanksgiving Day and what you plan to save until Friday. Whether you want the china washed and dried, the tablecloths thrown in the laundry or the turkeys deboned and disposed of, plan it out ahead of time. Most likely, you will have people offer to help and this way, you can direct them towards the right tasks. Sharing is caring, and the more leftovers you send home with guests, the less you have to deal with over the next several days. Have disposable trays or tins on hand, and you can easily send something with everyone. Give it time. As the hostess, the sure sign that you’re ready for guests to leave is to clean-up all around them. Do what you need but then sit down and spend time with your guests. Set out the coffee, watch a football game, play a game or just chat. The countertops, the food and the dishes will still be there on Friday and you’ll probably enjoy clean-up a little more in your jammies with some Pandora blaring than surrounded by a houseful on Thursday evening. Our checklist isn’t designed to give you a play-by-play of what goes in the oven and when you should chill the wine or serve the appetizers. Rather, we want to hit the highlights of what you need so you can make this holiday a fun, family-filled day for everyone – yourself included! So stuff the turkey, dust the shelves, mash the potatoes, clean the floors and set the tables. But don’t forget to take the time to visit, to smile, to eat and to enjoy!